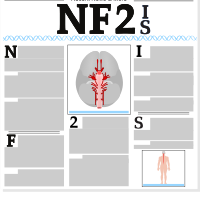 The NF2 Information and Services - News section shares new news articles a few times a week, there are older news topics that including basic explanations on different NF2 issues, treatment options, and treatment developments. A Neurofibromatosis Type 2 (NF2) story in the news. Awareness Months shares were also typed for the website, for individuals following NF2 Information and Services do not know Englush. Neurofibromatosis (NF); NF1, NF2, and Schwannomatosis (SWN/NF3) can leave individuals with severe fatigue from tumor cell growth on nerves which can result in; B12 Deficiency and a Poor Immune System. Learn more. Individuals with Neurofibromatosis (NF) may face isolation as a result of; Hearing Loss, or Skin Surface Tumors. 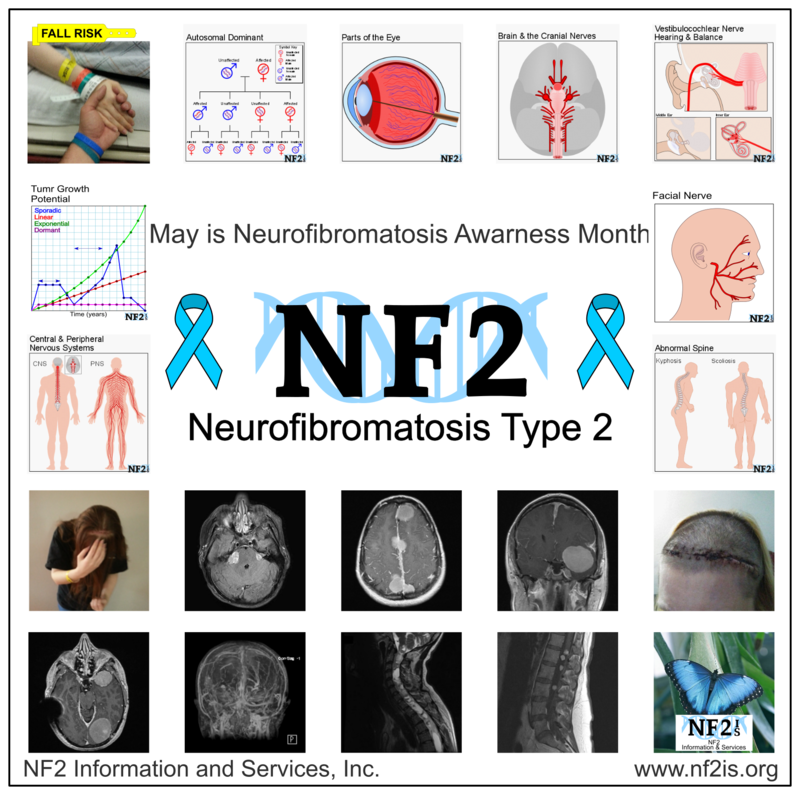 Issues for Neurofibromatosis Type 2 (NF2) typically, cannot be seen outside of an MRI of brain and spine, or without an eye exam. 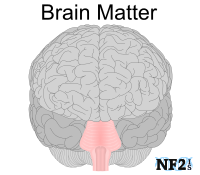 Criteria for diagnosis of NF2 requires more than the presence one (1) brain tumor. Neurofibromatosis Type 2 (NF2) is a genetic condition which develops because of damage to Chromosome 22. NF2 best known simply as a genetic condition that results in brain tumors that cause hearing loss and possibly other brain tumors. Doctors rarely expect to see more. 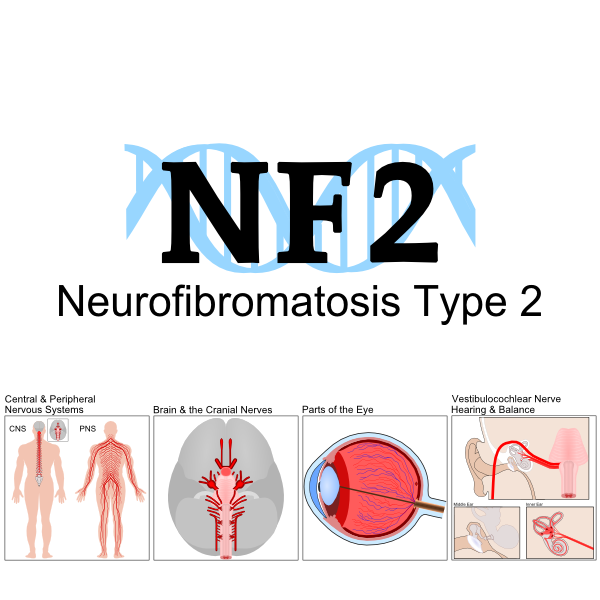 - Hospitals and Doctors need to know more about NF2. 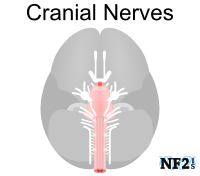 NF2 is a Genetic condition where tumors primarily grow on nerves for hearing, and through the entire central nervous system; brain and spinal cord. 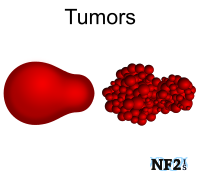 NF2 tumors may grow in all regions of the body depending on an individual's mutation of NF2. NF2 leaves many with single sided deafness before the diagnosis of NF2. 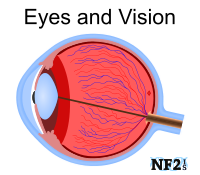 Many individuals with NF2 are deaf (98%), and partially blind by the age of 30. 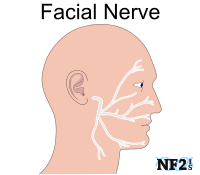 Many with NF2 face Paraplegia or Tetraplegia (Quadriplegia) from either Spinal Cord Tumors or Peripheral Neuropathy. 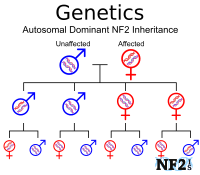 NF2 is not a Cancer condition but shares genetic commonalities with several Cancer conditions. Research for a Cure is needed. 95% of individuals with Neurofibromatosis Type 2 (NF2) develop Vestibular Schwannoma tumors bilaterally (left and right). VS grow for other reasons, but typically only one side. When Tinnitus starts, it is important to see an Otolaryngologist also known as ENT (Ear Nose and Throat Doctor) immediately and Neurologist for an MRI. Neurofibromatosis (NF) is a genetic condition more prevalent than other genetic conditions of; Cystic Fibrosis, hereditary Muscular Dystrophy, Huntington's Disease, and Tay Sachs combined. NF1 issues are not contagious, they can only be passed from parent to child. NF is a common condition, yet individuals with NF1 continue to have difficulty with diagnosis, even if others in their family are known to have NF1. Confirmed NF1 diagnosis by a Neurologist is necessary to receive proper care, but without a diagnosis, it is not possible to get the necessary help. Things an individual with NF1 may need include; help with pain management from tumor growth on nerves, or help with education. Even with a diagnosis, individuals with NF1 have difficulty seeing proper care of issues. There is no cure for Neurofibromatosis. Neurofibromatosis (NF); Neurofibromatosis Type 1 (NF1), Neurofibromatosis Type 2 (NF2), and Schwannomatosis (SWN / NF3) are Autosomal Dominant genetic conditions. However; NF can develop as a result of Spontaneous mutations and may be Mosaic, where not all cells in their body include damaged NF that can result in tumors or other issues. Many Spontaneous NF individuals receive diagnosed after they have children. A first-generation individual who may have Mosaic development might have fewer issues and tumors than their children if the NF mutation occurred early in fetal development. Neurofibromatosis (NF) are genetic conditions of Autosomal Dominant inheritance; Neurofibromatosis Type 1 (NF1), Neurofibromatosis Type 2 (NF2), and Schwannomatosis (SWN / NF3). NF1: If a person male or female has NF1, there is a fifty-percent (50%) chance children male or female are at risk of NF1. If they do not, their children will not be at risk. 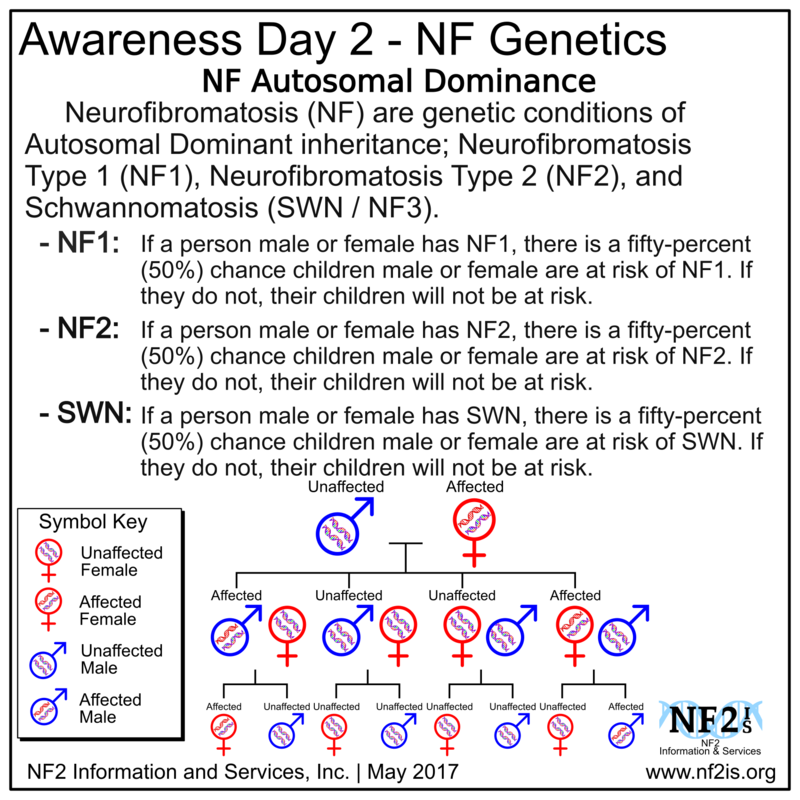 NF2: If a person male or female has NF2, there is a fifty-percent (50%) chance children male or female are at risk of NF2. If they do not, their children will not be at risk. SWN: If a person male or female has SWN, there is a fifty-percent (50%) chance children male or female are at risk of SWN. If they do not, their children will not be at risk. The diagnostic criteria for a person to be diagnosed with Schwannomatosis (SWN) follow a strict guideline established by the NIH. A diagnosis for SWN may if a person meets one of the conditions identified below. A diagnosis for SWN requires conditions identified in source. Neurofibromatosis (NF) include three types; Neurofibromatosis Type 1 (NF1), Neurofibromatosis Type 2 (NF2), and Schwannomatosis (SWN/NF3). NF are genetic tumor predisposition, but issues an individual with NF may face are not all the result of tumors. Which issues an individual may have, would depend on their NF type. Tests like MRI's, eye exams, blood tests, or other tests that may be necessary at different points in life, early diagnosis is important. NF type and exact form would also determine region or regions of the body tumors may develop. Developments in Genetics has proven that there are not one, or two, but three forms of Neurofibromatosis (NF). Neurofibromatosis Type 1 (NF1), Neurofibromatosis Type 2 (NF2), and Schwannomatosis (SWN / NF3). The Neurofibromatosis conditions; NF1, NF2, and SWN, affect people regardless of; gender, race, and country. Neurofibromatosis (NF) include three types; Neurofibromatosis Type 1 (NF1), Neurofibromatosis Type 2 (NF2), and Schwannomatosis (SWN/NF3). "Given the increasing use of Bevacizumab (Avastin™), a vascular endothelial growth factor inhibitor which results in an increased risk of bleeding, it is important to ascertain if there is a predisposition to vascular abnormalities in NF2." Afridi, Shazia K., et al. "Aneurysms in neurofibromatosis type 2: Evidence for vasculopathy?." American Journal of Medical Genetics Part A (2017). Date Shared: April 12, 2017 | Source: The Science Times. Date Shared: April 12, 2017 | Source Date: February 2017 | Source: American Society for Biochemistry and Molecular Biology. Molecular & Cellular Proteomics. "Neurofibromin (NF1) is a well-known tumor suppressor that is commonly mutated in cancer patients." "...findings may provide novel insights into therapeutic approaches targeting NF1-deficient tumors." Date Shared: April 11, 2017 | Source Date: April 2017 | Source: Shots. NPR Science Desk. Date Shared: April 10, 2017 | Source Date: 2015 | Source: American Academy of Neurology. Neurology Now. Small Wins - Small, measurable goals. Recovery is more like a marathon than a sprint. Enjoy the Moment, Thrive by Staying Healthy, Realize the New Me, Knowing Symptoms, The impact of Doctor Assumptions, Memory, Physical Activity, and Medication. Denial - Avoiding doctors and ignoring symptoms are both parts of denial, but even if it may be painful - to hear a diagnosis, it almost always opens the door to healing, especially if you have a rare degenerative condition. Knowing Symptoms - Diagnosis confirming symptoms are connected to a disease or situation, can offer relief. The impact of Doctor Assumptions - Doctors often assume the worst-case scenario. Unfortunately, this can affect outcomes. Memory - For people with degenerative diseases, it's possible to recruit different parts of the brain to compensate for areas that are diminished/dysfunctional. Small Wins - Small, measurable goals. Recovery is more like a marathon than a sprint. Physical Activity - Activity can boost brain function in regions associated with executive function, such as planning, scheduling, and working memory. Medication - Watch Your Meds Each person reacts to drugs differently. Accidental Contamination of HeLa has destroyed many studies. The bottom line was that "most published research findings are false." "The problem is especially acute in laboratory studies with animals, in which scientists often use just a few animals and fail to select them randomly. Such errors inevitably introduce bias. Large-scale human studies, of the sort used in drug testing, are less likely to be compromised in this way, but they have their own failings: It's tempting for scientists (like everyone else) to see what they want to see in their findings, and data may be cherry-picked or massaged to arrive at the desired conclusion." Finical support for biomedical research has been in sharp decline for some time. Open Science Framework has started to share data between researchers for finding treatments faster. Handheld EEG device quickly determines the severity of the head injury that may reduce the number of CT Scans done, less radiation exposure, lower cost. The portable device can evaluate brain injury scan outside of hospitals. Approved in 2016 and are 97% accurate for brain intracranial bleeding or brain trauma injury to determine if additional tests may be needed or not. "Subsequent studies confirm that inhibition of FAK1 is sufficient to suppress tumorigenesis in animal models of NF2 and that crizotinib-resistant forms of FAK1 can rescue the effects of treatment." Get help faster from your doctor from home. A doctor who already has an existing health report for you. Sometimes it can help to take a picture of yourself, the area of yourself you are concerned you have a health issue with and email the picture to your doctor with an explanation. It may not be enough for them to help, but it may be enough for them to say to rush to ER instead of their office, where doctors are ready to help with your specific issue. Hold doctor business cards for email addresses. What can we do to heal from surgery a little faster, and more completely? Is there anything that can be done to slow down nerve damage progression? B12/B Complex - Why and when it might be better in pill form. Reason for Share: Can this potentially help fight Meningioma or Schwannoma brain tumors? Chronic pain my be from brain expectation of pain. Recrudescence of herpes virus infections following resection of schwannomas. An antiviral role of merlin? If you have NF and you have an incident of a health issue that is new to you, call your doctor. Learn More about Epilepsy and Seizures. As we plan for Purple Day, March 26, for Epilepsy Awareness anyone who has seizures or children with seizures might want to review the information about service and support animals. The link includes sources to connect to for different services. International service animals source included on the page. Help raise Epilepsy Awareness and wear purple Sunday, March 26. Read and learn why and when you may be at risk if you have NF2. It takes more than one Seizure to have Epilepsy. How much is too much? Talk to your doctors about everything. Stem Cell Treatments are not standardized treatments methods for good reasons. They do not always respond as expected. More research is needed for proper use of any reason. Share with your family who cannot or will not learn sign language. This will help with Lip Reading. Do not hide all of your medication is "Safe Place" if you have a bad memory. If a medication is a strong prescription drug of "controlled substance," put most but not all in a secondary location. Understand that doctors will not refill medications under "controlled substance" easily with claims of lost medication. If you have Neurofibromatosis; NF1, NF2, and Schwannomatosis, you should know the risks and options for birth control for best timing and things to do for safe family planning. Risk limit is not just passing NF to a child. I think they are looking at something that may eventually help nerve damage including Peripheral Neuropathy including Polyneuropathy. Neuron healing limit may be if the Schwann cell is removed from the nerve. This means it may help some damage not all. Schwannoma = overgrown Schwann cell in the nerve. Stress can make a small issue seem worse. A minute or two of time alone can help reduce stress and help with issues of; 1) inability to Sleep despite Insomnia, 2) Headaches (including Migraines), 3) Tinnitus, 4) Blood Pressure, 5) Improve Circulation, 6) Anxiety and 7) issues for ADHD. Method to do this explained in the link. Included is a reason you may want to eat; Broccoli, Broccoli Sprouts, Brussels Sprouts, Cabbage, Cauliflower, Savoy Cabbage, Red Cabbage, Kale, and Horseradish if you have Vestibular Schwannoma or Schwannoma in other regions of your body. Neurofibromatosis (NF); (NF Type 1, NF Type 2, and NF Type 3, also known as Schwannomatosis) Cancer, or not Cancer, and why papers that note things that might make result in more harm to people with Cancers may also be dangerous to people with NF. In 2010, it was known people who are not Cancer prone react differently to foods than those who are looking to prevent tumor or Cancers. The only debate is which foods other than antioxidants this may apply to. 3 legal focuments to be ware of prior to first major medical treatment. Make certain in advance what you want is decided by you, not automatically by the medical system. Schwannoma tumors are an overgrowth of Schwann Cells. Schwann Cells are a part of Nerve Cells for communication of senses and for impulse for movement of the body. Things you should know if you drink or plan to drink Decaffeinated Coffee and are concerned about Cancers, Gastric Acidity, Iron Deficiency and Arthritis. Question: How safe is Tylenol (Acetaminophen)? Answer: Not as safe as you may think. The Cranial Nerve 8, the Vestibulocochlear Nerves starts at the center of the brain and splits to become the balance nerve and the hearing nerve, Vestibular Schwannoma, also known as Acoustic Neuroma grown on, and between these two nerves. A battle everyone born with NF2 will face, some earlier than others, is Bilateral Vestibular Schwannoma. NF2 typically also results in other tumors in the - brain, spinal cord and potentially other parts of the body, but Bilateral VS is the only issue consistent to everyone with NF2. Three forms of Neurofibromatosis (NF): NF Type 1 (NF1), NF Type 2 (NF2) and Schwannomatosis (SWN) are very different, but they all result in the growth of slow growing but still painful, dangerous, potentially life threatening tumors. 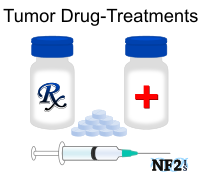 There is no treatment to permanently; stop, shrink and prevent more NF tumors from growing, but all NF tumors do not require treatment. The constant need to see doctors, purchase medications, have different medical test and treatments are a financial burden that results in issues that increases the risk of the dangerous, life threatening health issues, when not lowering the quality of life due to financial limitations. The three forms of Neurofibromatosis are; NF1, NF2 and Schwannomatosis. The criteria for a diagnosis of each form of NF are included here and should be known by anyone with any form of NF. It is important to understand that while NF is rare, it is statistically unlikely to have more than one form of NF. It is also statistically likely for a person with any of the three forms to be told they might have more than one form of NF. Since tumor growth for each is different it is important to know for a fact which form a person has. Due to similarities between the three forms, the accidental diagnosis of more than one form of NF is an easy one for doctors to make. Neurofibromatosis (NF), initially called Von Recklinghausen disease, is not one but three separate genetic conditions that all result in the growth of tumors and neurological issues. The three diseases are called; Neurofibromatosis Type 1 (NF1), Neurofibromatosis Type 2 (NF2) and Schwannomatosis. The history of NF is complicated and the development of genetic testing was needed for researchers to realize that there are in fact three forms, but this fact is not even commonly known today by all doctors since NF is rare and in some cases not even identified at all. The results are a common issue of inaccurate diagnosis of the wrong NF form and individuals not receiving the proper testing for treatments needed. Reminder: May is Neurofibromatosis Awareness month. The attached link includes some facts that can be shared with others. There are a few misconceptions to Neurofibromatosis Type 2 (NF2) Clinical Trials that everyone with NF2 should know; 1) they are not Chemotherapy, 2) that are Tumor Target Treatments, 3) they are not guaranteed to work, 4) there is more than one and 5) side effects of not are still potentially helpful. Meditating has been proven to do many things including increasing their ability to think, control anxiety and can be included in life to help with overall health. Vestibular Schwannoma are not exclusively to NF2, the concern of not just Single Sided Deafness but Deafness in Both Ears means different treatment methods should at least be possible to be done by the doctor. Dr. Asthagiri shared the success rates between Radiosurgery and Surgery. Radiation treatments of any kind result in side effects just as easily as Surgery, one difference is most Radiation side effects are not issues till well after treatment. Surgical options do not always include hearing loss, but depend on the tumor and Surgical Approach. The 2015 NF2 Ohio Gathering invited doctors to speak about NF2 with key speaker Dr. Asthagiri previously from the NF2 NIH study, now at the University of Virginia. Some of the topics included; 1. tumor issues including but not limited to 2. the difference of NF2 Vestibular Schwannomas and non-NF2 Vestibular Schwannomas biologically as well as in terms of reactions to treatments, 3. why clinical trials to date are limited, 4. Hearing Implant options, and 5. Vestibular Rehabilitation for balance issues. Fortunately the ADA and the Department of Justice, Americans with Disabilities Act of 1990, interpreter use during all hospital related visits is legally required and is not a cost to the patient. This includes some of the options explained here. The NF2 Information and Services website contains a great deal of information about: Information and Services, NF2 News and Relevant Medical Updates. Once the organization raises enough in donations for free distribution of NF2 print material, we hope our newer news section will help with recent advancements to help people even more. This article explains how a Craniotomy method was done to remove some NF2 tumors and explains how an IV drain was put in place to drain the Cerebrospinal-Fluid (CSF), to prevent a CSF leak following surgery. New research of genetically engineered stem cells for Brain Cancer that kill tumor cells but nothing else. 3D printing is the creation of items with a machine that melts plastic in layers. Some of the items of interesting notice at the 2014 New York - Makers Faire were science and medical in nature. Development of a clinical trial of a dry eye treatment, that will not just coat the eye, but bind to the eye itself. NF1 treatments are different from NF2 treatments proper diagnosis is important. In an article seen at Genetic Engineering & Biotechnology News, called "Shrinking Tumors with Injections of Engineered Bacteria" in April 2014, bacteria use to destroy tumor cells was the topic in review. The importance of vitamins and food management which can help raise the immune system. For anyone who is looking for something that will; definitely stop, definitely shrink, definitely prevent the creation of more tumors in a person with NF2 who has VS or other tumor forms and locations, there is none. There are however options to potentially help slow tumor progression down. Today research is finally proving that children with health issues parents did not have are the result of different things a mother is exposed to prior and during pregnancy, especially with chemotherapies. Vitamin B12 is important in the formation of all cells in the body, especially red blood cells and the covering of nerve cells (myelin). The body needs myelin for nerves to function properly. NF2 results in Juvenile Cataracts and Other Optic Abnormalities. Some of those other eye issues are explained here. Cancer treatment revolution potential with new drug explains expectations of a new medication in development that can attack Cancer Cells in multiple ways and result in fewer side effects. Cognitive Brain Development is an issue with different brain tumor management treatments. Improving Health with Dark Chocolate consumption Dark Chocolate is 75% Cocoa Powder. "New research suggests that beneficial bacteria that reside toward the end of our digestive tract ferment both the antioxidants and the fiber in cocoa." Vestibular Rehabilitation Therapy (VRT) - WHAT IS VESTIBULAR REHABILITATION THERAPY? Be it chemotherapy or gene therapy, saving tumors after surgery may eventually be helpful in your own treatment needs.